MAGNUM - LIVIN’ THE DREAM (2DVD) | Online Shop | Wizard LTD. Album: "LIVIN’ THE DREAM (2DVD)"
Founded in the mid-Seventies, Magnum brought out their debut, Kingdom of Madness, featuring diverse prog-rock of the melodic variety, in 1978. Magnum II, out one year later, sounded even more symphonic, and their first live album, Marauder, arrived at the stores twelve months later. Chase The Dragon (1982) and The Eleventh Hour (1983) documented the musicians’ unmistakable development, but the big breakthrough took a long time in coming. It arrived, deservedly, in 1985 with On A Storyteller’s Night, Vigilante (1986) (produced by Queen drummer Roger Taylor) and Wings Of Heaven, which made no. 5 of the British album charts and spawned three top 30 single hits. Celebrated tours and invitations to most important open-air festivals of the Eighties followed, the Reading Festival, the Monsters Of Rock in Castle Donington among them, as well as several shows at the Wembley Arena and annual appearances at the legendary Hammersmith Odeon. In the early Nineties, the musicians flew to Los Angeles, where they recorded their Goodnight L.A. album, composer Clarkin being supported by Russ Ballard and Jim Vallance. The band’s record company released The Spirit, featuring rare or previously unreleased tracks from another studio session, towards the end of their mutual contract, followed by Sleepwalking, another new, regular studio album soon afterwards. The first chapter of Magnum’s success story ended in 1994 with Rock Art and a major farewell tour, during which the final live album The Last Dance (out in May 1996) was recorded. With their last release, Brand New Morning, and the impending European tour in late summer 2004, the band offered an exciting preview of the future which allows but one prognosis: Magnum will be a force to be reckoned with for years to come! 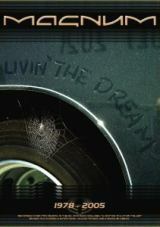 And this culminates in the release of the new DVD "Livin`The Dream". Packed with over 215 minutes of Magnum stuff - a dream for all fans come true. * Acoustic track: A specially filmed acoustic version of "The Spirit"
* slideshow: 57 exclusive photos, live and on the road.